Lake Sandoval is listed as one of the most beautiful and beautiful lakes of the Peruvian Amazon. It is a masterpiece of lake geography. Amazon Adventure Travel – Canopy walkway : You can literally walk among the treetops right in the middle of the rainforest canopy, the site of the highest biodiversity in the world, strolling among the leafy branches and enjoying the ‘high life.The walkway is among tierra firme forest, atop a ridge. The steps take you around and up trunks and branches – through the lush vegetation, to the tops of immense trees. built on a slope, from the walkway’s higher points you can see over the trees: a rolling ocean of multi-hued green, unbroken forest stretching as far as the eye can see. It is an awe-inspiring sight. Amazon Adventure Travel – Canopy walkway : You can literally walk among the treetops right in the middle of the rainforest canopy, the site of the highest biodiversity in the world, strolling among the leafy branches and enjoying the ‘high life. The walkway is among tierra firme forest, atop a ridge. The steps take you around and up trunks and branches – through the lush vegetation, to the tops of immense trees. built on a slope, from the walkway’s higher points you can see over the trees: a rolling ocean of multi-hued green, unbroken forest stretching as far as the eye can see. It is an awe-inspiring sight. You are welcomed and pick-up from the airport/coach terminal of Puerto Maldonado by our Representative to take you to our office where you can leave your baggage not necessary for the trip. 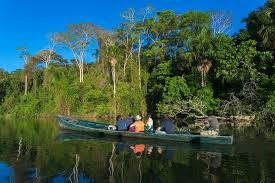 Then, we transfer you to a local port where you board a motorboat and navigate up the Madre de Dios River. On the way, we observe various mammal species such as turtles, birds, lizards, monkeys and much more, until we reach Cachuela Lodge where we accommodate ourselves before we are served lunch too. Afterwards, we go for a walk to the surrounded jungle. Optional: Canopy, zip-line and a night walk. Very early before breakfast, we head for the nearby Cachuela clay-lick to observe macaws gathering to eat clay helping them to digest and get off toxins contained in jungle trees and plants. After this activity, we get back to the lodge to have breakfast supplying us with more energy to later board a motorboat and navigate down the Madre de Dios River watching animals such as turtles, caimans, lizards and others around its shores. Then, we shortly stop at the Monkey Island to view some of its 3 monkey species. Later on, we continue to a checkpoint of the Sandoval Lake Reserve and after passing a check we start walking for 5 km to reach Sandoval Lake where we take a canoe bringing us to the Maloka Lodge . There, we accommodate ourselves and after lunch we return sailing the lake in a canoe to see its typical inhabitants – giant river otters, black caimans, a prehistoric bird shansho, herons, cormorants, kingfisher, etc. Then, we return to the lodge for dinner to later get back to the lake again, this time to undertake an evening caiman observation because caimans are nocturnal animals. Our professional naturalist Tour Guide shows and explains us about these animals. We overnight in the Maloka lodge. Another early wake up expects us today as we go to the surroundings of the Sandoval Lake where huge number of various palms grow in its water creating an area of marsh. This place is called Collpa de Palmeras and it attracts various macaw species and other parrots to eat sawdust of its palms as it contains sodium, calcium, potassium and other minerals helping them to digest. Then, we go back to the lodge to be given breakfast. Later, we take a next trip going to observe stunning flora and fauna of the Sandoval Lake Reserve. We can appreciate monkeys, deer, wild boars, tapirs or spectacled bears, just to name a few. For lunch, we get back to the lodge. Afterwards, we have given some time off to rest or enjoy a bath in the Sandoval Lake (no worries, there are no piranhas or other danger animals during the day). 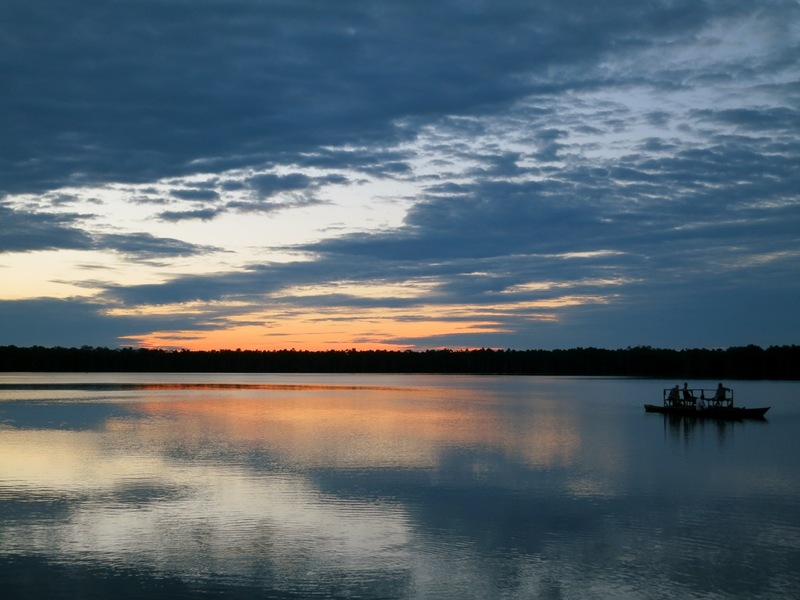 Then, we board a canoe to cross the lake to a place where we can better appreciate a beautiful sunset above the lake! At 7 pm, we return to the lodge for dinner while waiting for the moonlight, a suitable time to go watching caimans again! An overnight is in the Maloka lodge. After breakfast, we first board a canoe to sail over the Sandoval Lake and then we walk back to the checkpoint and from there, we continue sailing the Madre de Dios River by a motorboat towards Puerto Maldonado. We pick our baggage up in our office and then, we are transferred either to the airport or the coach terminal.